Steve Zimmer at Mosk Elementary School. LA Unified is making no bones about wanting to change the chicken industry, and federal officials visiting the district Thursday say they’re on their way to doing it. LA Unified became the first large school district in the nation to contract for antibiotic- and hormone-free chicken and turkey in a vote Tuesday. On Thursday, visiting dignitaries from the U.S. Department of Agriculture said that such a bold move could have a direct effect on the way poultry is handled in the country. 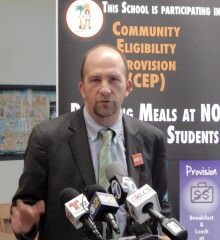 The leadership came from school board president Steve Zimmer, who is seeing the culmination of more than two years of work since getting the Good Food Procurement resolution passed that supports local farmers and local economies and seeks alternatives to foods that are genetically modified or hormone-filled. The cost will be higher, in fact about 67 percent higher, than the chicken the district has purchased in the past from Tyson Foods, said Laura Benavidez, interim Food Service Division deputy co-director. The new contract is with Gold Star Foods from Perdue Farms in Ontario, Calif.
“The cost will become less and less of an issue as more districts join us,” Zimmer said. LA Unified serves 700,000 meals a day, which include favorites like chicken teriyaki and chicken drumsticks. Over the past decade, the school board required more nutritious meals with less fat, salt and sugar, plus additional servings of fresh fruits, vegetables and more meat-free options, such as Meatless Mondays, which is part of the school menu. Chocolate and other flavored milks have been replaced by low-fat or nonfat milk, and sodas and junk food are no longer for sale at schools. At Tuesday’s school board meeting, student board member Leon Popa said that he learned in school about Tyson products and was concerned about the antibiotics. “What I learned in school was really horrendous, and the problem continues to grow,” Popa said.